Good evening, girls! :) Welcome to Part II of my first ever Sephora.com haul. :) The other item that I got was also a value set. 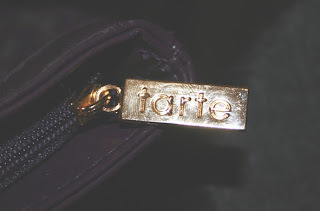 This time it is Tarte. 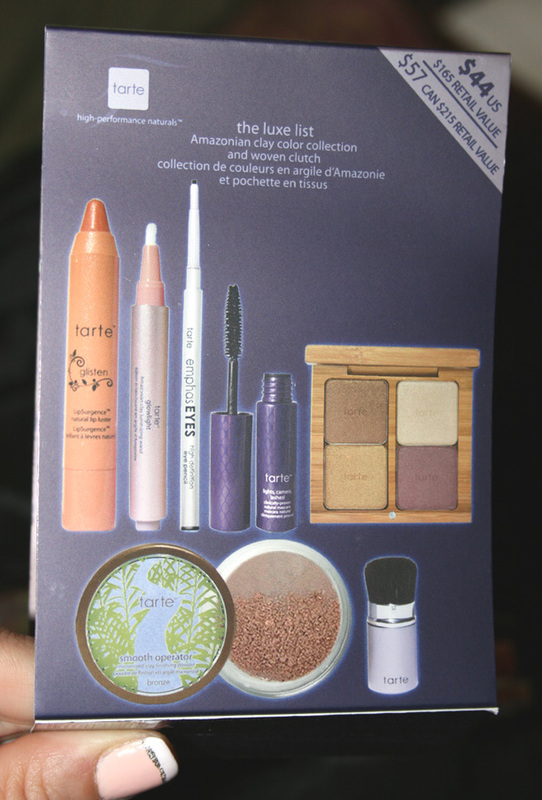 The collection is called "The Luxe List Amazonian Clay Colour Collection." 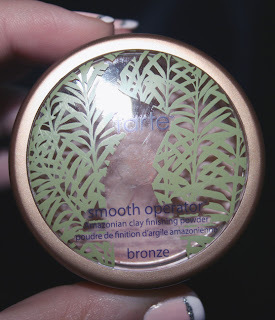 I've never tried any tarte products, so I thought getting a deal like this would give me a good chance! It came with a mix of full size and deluxe samples. 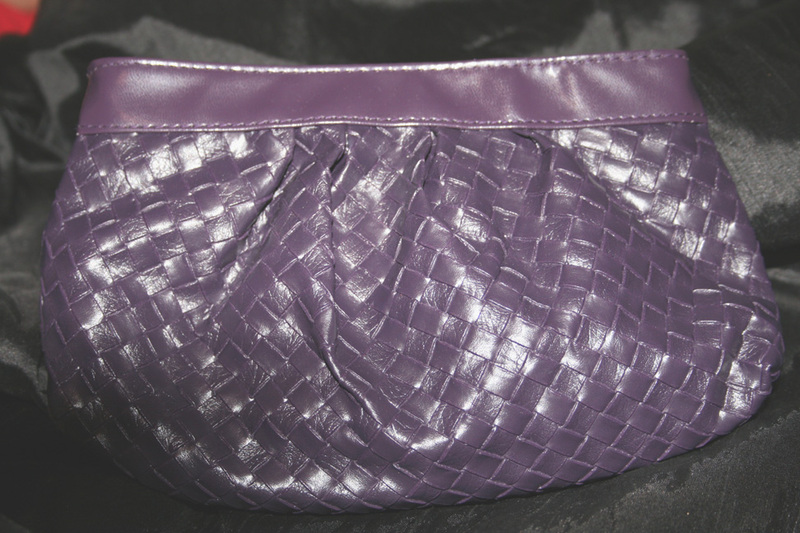 This bag like Benefits bag (which isn't a bag I'll keep..maybe to ship a giveaway?) has the name on the zipper pull. Love little touches like that, do you? The bag came wrapped in this packaging. I payed $57 Canadian and it's a retail value of $215 Canadian. I'm annoyed that it retails for $44 US ($165 US value)..almost $15 more. ugh. But, to me it still seemed like a really good deal. It is right...RIGHT? 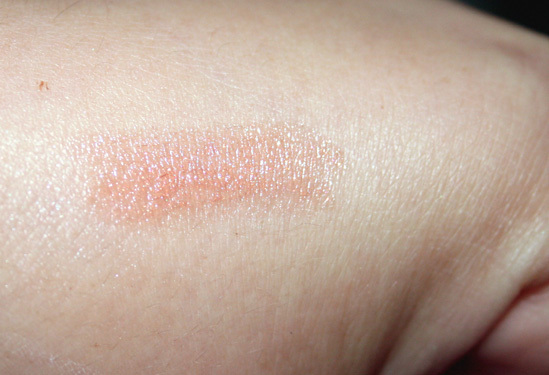 This is a full size LipSurgence lip luster in glisten. I love the packaging. Everything is so shimmery. It's really a big giant fat pencil. Oohh...it's so shimmery and pretty. It smells REALLY good..minty. The nice thing is you don't have to sharpen it. You click the bottom and it comes up. I just adore this. It was quite difficult to get a picture in the evening. 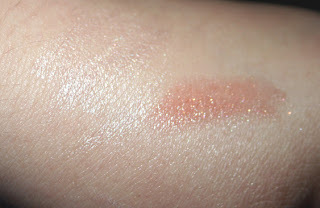 It's fairly sheer..but it has a ton of shimmer. Perhaps if you click the picture it might give you a better idea. 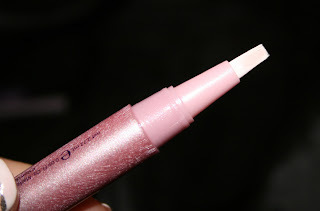 This is a full size glowlight amazonian clay luminizing wand in pink. I also really love the unique packaging to it..it's like a scratched up shimmer. 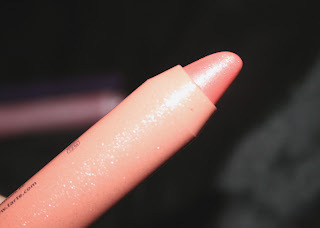 It's system is like the lip brushes that you click and it comes out the top. I'm NOT really a fan of that kind, because you never know if you're putting out too much product and it can get wasteful. The shimmeriness on the left is what this gives you. It was hard to get a picture of. I'm not sure if I'm liking this product..in my test I didn't find it gave a lot of payoff. 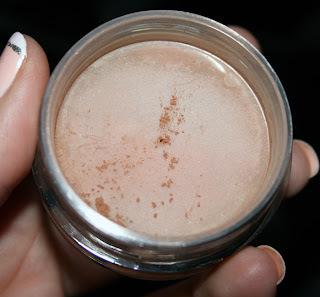 If you put it on the with the brush it's streaky and when you try to blend it, it disappears. What I don't like about it, is the one tiny little hole to get the product out. 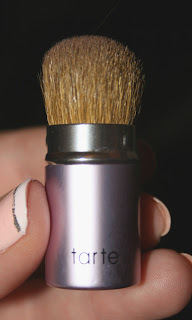 To go with the powder is this really sweet kabuki brush. I love that it has a cover and is transportable in your purse or makeup brush. 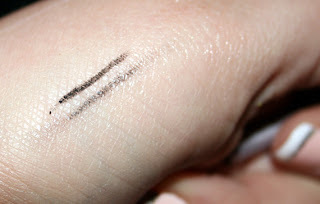 Next is the deluxe sample of empasEYES high definition eye pencil in black. It's a mechanical pencil, which I don't think I'm really a fan of. I really like my gel liners. I'll definitely try it out though. This is how it looks swatched. You can see not overly crisp. The bottom is how it looks when I smudged it with my finger. 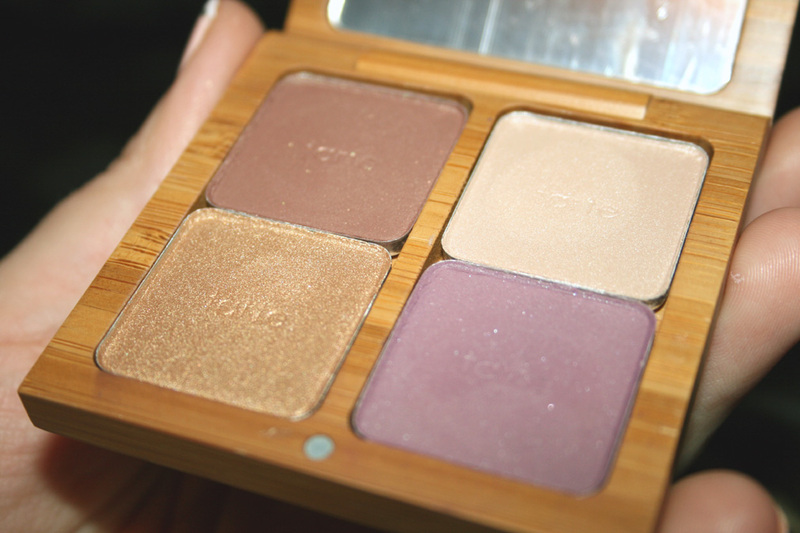 Lastly, a full size amazonian clay eye shadow quad. 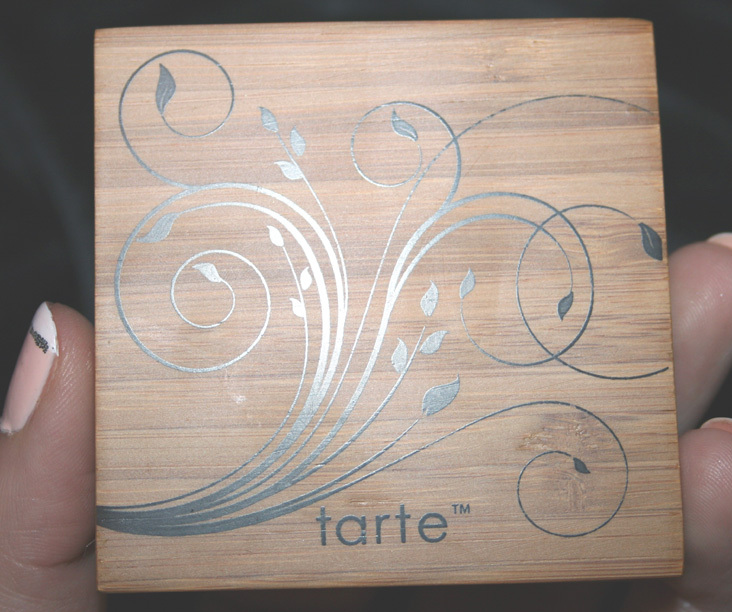 Oh my goodness...I just adore the wooden packaging. It stays closed with itty magnets. Here are the gorgeous colours. I mean GORGEOUS. My picture does it no justice. This palette is huge! The two on the left are metallic, the top right is a very subtle shimmer and the bottom right is shimmery! I really can't wait to play with this! So, there you have it! 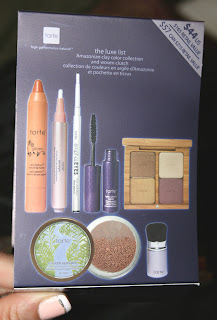 I really enjoyed all the products that I got from Sephora via these two value sets. The total for both set me back $103 Canadian...but I really think I got good deals with all the full size products. I hope you've enjoyed my posts! Have a lovely wekeend! Sure thing. Thank you for stopping by! Thank you! Yes, the palette is really amazing! I take my pictures at night, so I can't really capture the real beauty of it! argh! Ekk! 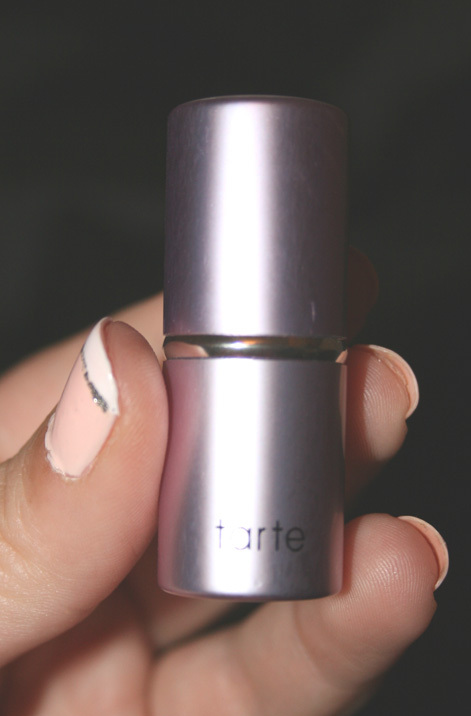 I wanna try tart sooo badly soon! I will .. I must! Hehe, Yes! I am sure you will. :) The kits really are the best deal! The bag is really cute and I love your nails! 50 followers and a blog hop! A Quick Post of Bits and Baubles! My Swap with Florence in FRANCE! Wanna win Shellac for Life? !